We all know that being fat is bad. It’s been drilled into our head by dietitians and pop personalities on TV for decades. Yet, losing weight is not an easy task for a lot of us – it takes effort and control. For dogs, feeding the best weight loss dog food can help them shed the unnecessary pounds. Unfortunately, pet obesity is a continuously growing problem in both dogs and cats. Studies found that most of this is related to poor food management on the dog owner's part, and obesity in dogs could be cured and prevented when taking into account interrelationships between social factors, proper diet and exercise (Bland et al. 2009). Now imagine how hard it must be for a dog to lose weight, considering they don’t even realize that being overweight is a huge health concern, nor do they control their own diet. Veterinarians warn about the serious implications of obesity in dogs. An overweight dog lives roughly 2-3 years less (Greer et al. 2007; Corbee 2013). That’s a lot for a dog – it’s approx. 20% of your pet's entire lifespan. There's been a lot of research done to date to find out how obesity affects dogs, their health and their life span. The evidence and results are consistent: dogs that are at healthy weight will always live longer than fat dogs. Specifically, a 25% reduction in food for fat dogs results in an increased median life span and decreases a chance of multiple chronic diseases in dogs (Kealy et al. 2002). With the above in mind, it's surprising more owners aren't looking for the best weight loss dog food to reduce the calorie amount without sacrificing nutrition for the canine. Research has found (Bland et al. 2009) that this is mostly because pet owners aren't aware or are misinformed on the proper weight management for dogs. What’s more is that a lot of dog owners don’t seem to realize that their pets are overweight. In fact, this specific subject – pet owners' perception of their dogs – has been studied extensively. This article explains well exactly how you can increase your dog's life span by simply making the right assessment of his weight. That being said, if you have an overweight dog, seeking veterinary or canine nutritionist consultation may be a good idea. Opting for the best weight loss dog food for fat dogs may also bring desired results in decreasing your dog's waistline. Here's what you should know. RECOMMENDED: Ask A Vet – How To Put An Overweight Dog On A Diet? You may be just about to close this article thinking that it doesn’t apply to your dog, but take a moment and consider – doesn’t it? To determine whether or not your dog is overweight, you can do a few very simple tests. First, feel the dog’s ribs with your hands. The ribs should be very noticeable to the touch. There should be fat on them, of course, their shape shouldn’t be visible through the skin and fur, but they should be noticeable to the touch. If you can’t easily and distinctly feel your dog’s ribs, he’s overweight. Next, check the area at the end of the dog’s back, just before the tail. There should be a slight but distinct flatness there. The bones shouldn’t protrude. If they do, the pet is too thin, but if you can’t feel any bones whatsoever, then the dog is overweight. You can also check out other prominent bones on the dog’s body. Feel his neck, shoulders, spine and hips. Again, if you can’t feel them well enough, your dog’s overweight. Take a look at your dog from above. Your pooch should have a definite waistline behind the ribs (PDF). If it’s too prominent, your dog’s too thin, but if there’s no waist at all, he needs a the best weight loss dog food. Finally, look at your dog from the side. The belly should be smaller than the ribs. It shouldn’t be too small, or the dog is too thin. If the belly is as big as the ribs or bigger, your dog is in trouble. What do I do if my dog is overweight? One advantage that dogs have over us when it comes to losing weight is that they are not responsible at all. It all depends on us! We are basically their own, free, personal weight loss managers. Consult your veterinarian – This should always be the first step, because while the extra weight can be due to simply a lack of exercise or an excess of fats in the food, it can also be the result of a disease. It can be a sign of problems with the metabolism of the dog, of hormonal problems, etc. With pets, it can also be the result of spraying or neutering. We won’t go too deep into exercise here. Suffice it to say that you should give your dog the opportunity to run, jump and play actively outside as much as possible. That doesn’t mean that you should force it, but simply that you should give him more opportunity to have active and playful fun. Too often, especially in the city, dog owners leave their pets with almost no walks outside. Some dogs only go outside for mere minutes, just so they can do pee and poop. Every dog, no matter his age, weight or health condition, needs adequate exercise to keep his body healthy. But, while giving your dog more exercise is usually relatively easy and simple, feeding him properly can be a challenge. And, it is just as important! In order to shed some pounds, your pet needs a diet that’s low in calories and fats, but doesn’t compromise with the nutrients. Your dog's diet still needs to be above average in proteins and minerals, so that Fido doesn’t get malnourished. It should always be with a high fiber content, so that your dog’s digestion is healthy and he feels full after each meal. A dog's food should also have enough vitamins and minerals, which your veterinarian will explain. What makes the best dog food for weight loss? Choosing your dog's diet – especially when considering calorie reduction and proper nutrition – may seem like a difficult task at first. You must consider several factors and what actually makes the best dog food for weight loss perfect for your pet. If you're vet wasn't of help, you can do most of the research and calculations yourself. The best weight loss dog food should have above average protein. The average protein in dry dog food is 29% and in canned dog food it's 40%. The best weight loss dog food should have below average fat. The average fat in dry dog food is 16% and in canned dog food it's 23%. The best weight loss dog food should have below average calories, meaning no more than 400 calories per cup of dry or canned dog food. With those in mind, I've also picked out some of the most popular brands out there that pet owners found to be palatable and veterinarians often consider to be the best dog food for weight loss. Note that these aren't your only choices, and you can find other weight loss food for dogs out there, including making your own homemade dog food. So, now that we’ve laid out the basics, let’s go over some ideas for the best weight loss dog food that may work well for your pet. First, we’ll mention our 10 suggestions for commercial weight loss dog food and then we’ll mention several recipes for good homemade dog food for weight loss. The formally called Spot's Stew recipe is now repackaged in this great Halo Spot’s Stew Healthy Weight Grain Free Turkey and Duck Recipe. Providing great digestion and a lot of bio-available nutrients, this weight control dog food recipe is amazing for fat dogs that are in need of losing weight. The turkey and duck combination is rather rare, so if your dog has a taste for it, this is one of the ideal dog foods you can put in his bowl. It has no GMOs, no meat meal of any kind, no preservatives or artificial colors and flavors. This best weight loss dog food has reduced calories and fat, and the L-carnitine greatly boosts the dog’s metabolism. Premium Edge makes our list of the best dog food for weight loss due to its nutritional content and well-reduced caloric amount. Their Healthy Weight formula for adult dogs in particular is well regarded. A great dry food for both weight loss as well as maintaining a recent loss of weight in dogs, this dry dog food offers low fat and calories, and medium proteins. Premium Edge Healthy Weight I Weight Reduction Formula Adult Dry Dog Food also contains L-carnitine, which helps by greatly improving the dog’s metabolism. This aids in an even faster and steadier weight loss. A great mixture of salmon, chicken and eggs, this Dr. Tim’s recipe is rich on protein, but low in calories and fat. It's just what your dog needs for losing weight. 77% of the proteins in this formula are animal derived. Tim's Premium All Natural Pet Food Metabolite Weight Management Dog Formula also contains L-carnitine, as any good weight control formula should, since it improves the dog’s metabolism. The complex fiber blend of this dog food recipe also contributes greatly to its effect, as it keeps your dog feeling full between meals. Free of any corn, soy, wheat, or other grains, this Wellness dry food recipe is one of the best weight loss dog food brands out there. Wellness CORE Natural Grain Free Reduced Fat Dry Dog Food has pure, high-quality meat as its main ingredient, working in conjunction with a blend of vegetables, botanicals and nutritional supplements. It also lacks any artificial preservatives, colors or flavors. It is low in fats and calories, but rich in proteins and L-carnitine, which culminates in a great weight control dry dog food for any dog in need of a quick, but stable and healthy weight loss. Another great grain free recipe, this Annamaet formula is a mix of chicken, duck and herring. It is holistic and like with most similar quality brands, it doesn't contain any soy, corn, wheat or other grains, and also has no any artificial preservatives, colors or flavors. Instead, it is made of only high quality meat products and supplements. It is low in calories and fat, and above medium in proteins. The presence of L-carnitine additionally makes Annamaet Grain Free Lean Dry Dog Food excellent for weight loss of any overweight adult dog or larger breed puppies. Diamond Pet Food also makes our list of the best weight loss dog food with this Taste of the Wild canned recipe. A great addition to their dry food, but also great by itself, this is a highly digestible formula made from real roasted wild boar. As a result, it isn’t surprising that Taste of the Wild Southwest Canyon Canned Dog Food is one of the most delicious canned dog foods you’ll find out there. The added flavor of sweet potatoes and peas, as well as other fruits and vegetables only compliment the great recipe and add to its great digestibility. An amazing source for natural antioxidants, this dog food is great both for a healthy weight loss, as well as for maintaining an overall healthy lifestyle. Victor Dog Food Senor Healthy Weight Management Diet Dog Food earns this spot on our list with their health weight management dog food formula. Free of any soy, corn or wheat, just like all the other Victor Dog Food recipes, it also lacks any artificial flavors or colors. Instead, it is rich on vitamins and minerals, as well as in proteins and L-carnitine, while also being quite low in fat and calories. A premium dog food with great taste and a very strong and positive effect on your dog’s weight loss efforts, this Victor Dog Food recipe is a worthy addition to our list. This Shredded Chicken Entrée by Fromm is another great canned option for your dog and its weight loss plan. Rated as one of the best weight loss dog food canned varieties for a reason, the Fromm Four-Star Canned Dog Food – Shredded Chicken Entrée has a great taste and smell and is able to satisfy even the pickiest of eaters. At the same time, this food gives your dog the slender figure that he deserves. Rich on protein, but low in fat and calories, this dog food could have easily competed for the top of this list had we made it numbered. Another entry from Fromm – the only ones with two spots on our list of the best weight loss dog food – this Coast Grain free weight management formula is another great option if none of our previous entries have caught your eye yet. Made from a special blend of whitefish and salmon, if your dog loves fish, it will certainly adore this food. 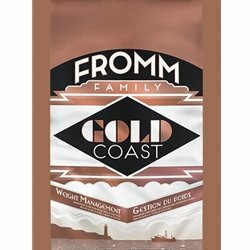 Low in calories and fat, without sacrificing any of the other valuable nutrients, Fromm Gold Coast Grain Free Weight Management is also rich in proteins and L-carnitine. In short, this dog food will make your fish-loving pet be happier beyond measure, lose weight quickly and healthily, and also maintain its new great figure afterward. We are rounding up our list of the best weight loss dog food with a classical entry with EUKANUBA Weight Control Adult Dry Dog Food. Ideal for any overweight dog or even less active smaller breeds, this Eukanuba recipe has a special fiber system made from natural beet pulp and prebiotics, ensuring a comfortable weight loss, while giving your pet a feeling of satisfaction between meals. It promotes an effective and healthy digestion and a lot of nutrients. It is low in fat and calories, but also rich in proteins and L-carnitine, making for another ideal choice for dogs that are looking to lose some weight. The above list of best dog food for weight loss is made up of commercial brands that are often vet recommended. However, if you like cooking for your dogs, and you know how to do it right without making your canine malnourished, homemade dog food for weight loss may be another great option. Below are some of the best homemade dog food weight loss recipes. Before you get into them, take a look at our Homemade Dog Food Recipes dedicated section where we have videos and articles explaining cooking for dogs, as well as step by step guides on using these recipes with tips and explanations. 1000 kcal and 24 grams of fat per 1000 kcal. The preparation of all of these recipes is rather identical. The boneless meat can be either cooked or raw, but the boned meat should always be cooked (never feed your dog raw bones and boned meat). The vegetables should either be only slightly cooked or pureed in a food processor or blender. The more starchy carbs should always be well cooked. After that, just mix the ingredients and serve. Obviously, these are all approximate recommendations. They depend on your dog’s breed, activity and metabolism. To be sure, it’s best to talk with your vet or a canine nutritionist. Whichever option you choose, whether commercial or homemade dog food, make sure you always go with the highest quality. Always give your dog plenty of exercise, and always take your vet’s advice.